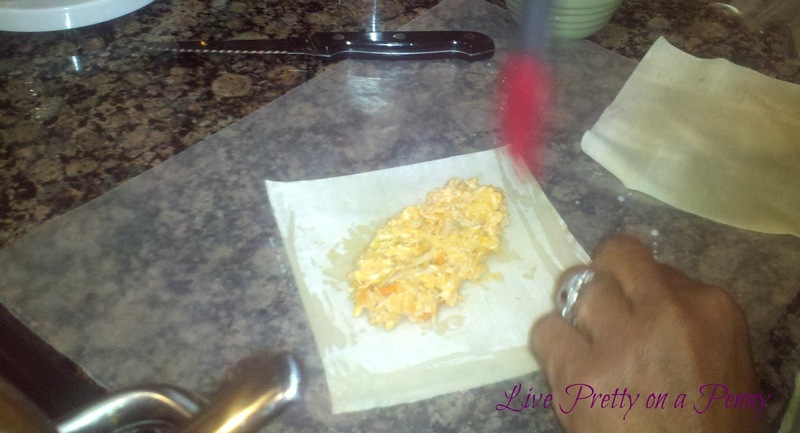 Today I am featuring a great budget friendly party recipe by one of my great friends, affectionately known as Scooter:) She and her mom put together a delicious meal this past weekend featuring Buffalo Chicken Egg Rolls, and once I tasted it (heck even heard about it), I knew I had to share with you guys. My buddy was gracious enough to put together step by step directions, including photos from her camera phone, so let’s check it out! Woo hoo! Take the rotisserie chicken and peel off the skin and any excess fat. They used both of the legs and thighs and most of the breast. 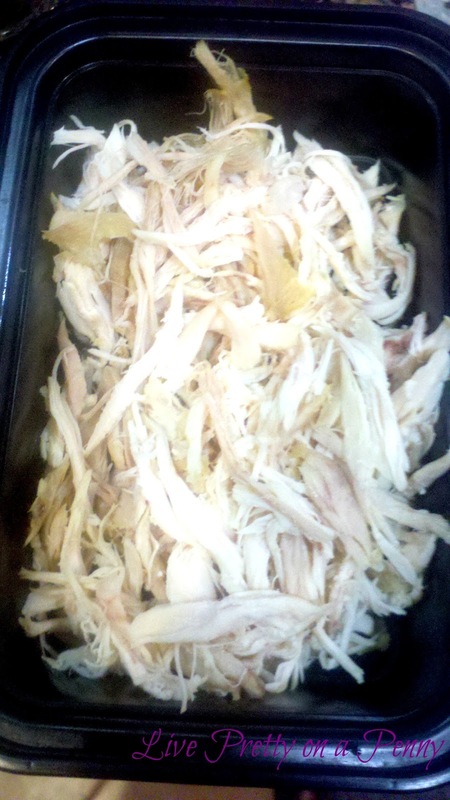 In all, about half of the chicken was used, pulling it off in big chunks and cutting with a chef knife. Just shredding by hand works as well! After preparing the chicken, melt the 1/2 cup of butter. Once the butter is melted, add the hot sauce and stir. *Note: Taste the sauce mixture before adding the veggies and chicken. If the sauce is too hot, lemon may be added to cut out the spice. 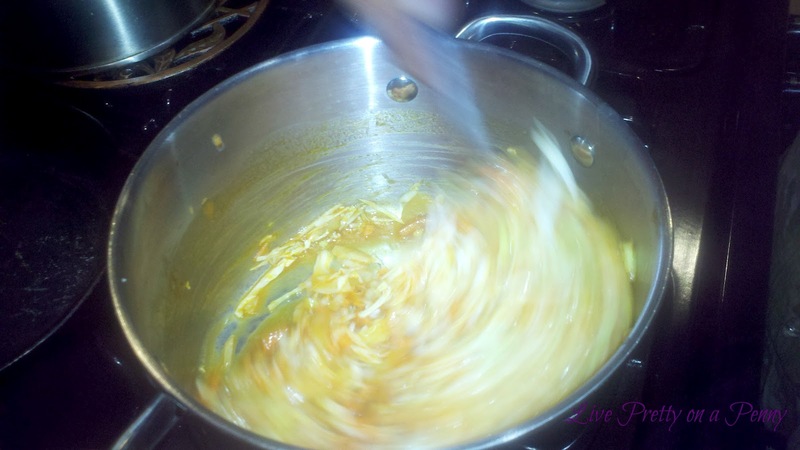 While melting the butter, shred the cabbage using a mandolin or a chef knife. We used ¼ of a small cabbage which measured to about 2 cups shredded. Next, take your shredded carrots (we used matchstick carrots), and cut them in half. Also, chop two stalks of celery which measures out to about ¾ cup. Coarsely chopped for a little extra crunch. 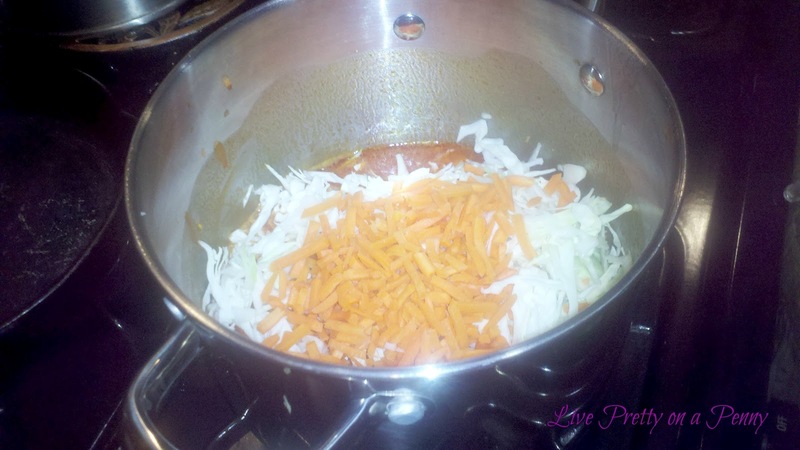 Once the cutting is complete, add the carrots, celery, and cabbage to the butter/hot sauce mixture, until heated thouroughly. Stir the chicken into the mixture until well heated. Make sure all of your sauce is absorbed, to ensure egg rolls aren’t runny. 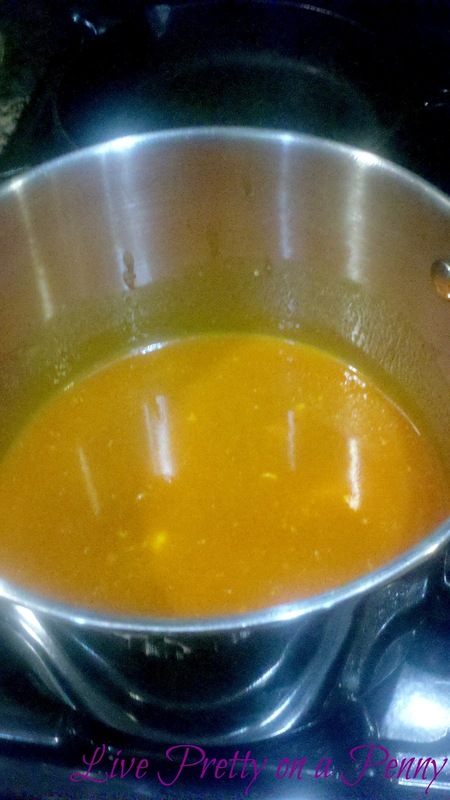 If it is too saucy, continue to stir until sauce is absorbed. Next, Heat 1 ½ inch of oil in a large skillet. Now for the fun part! 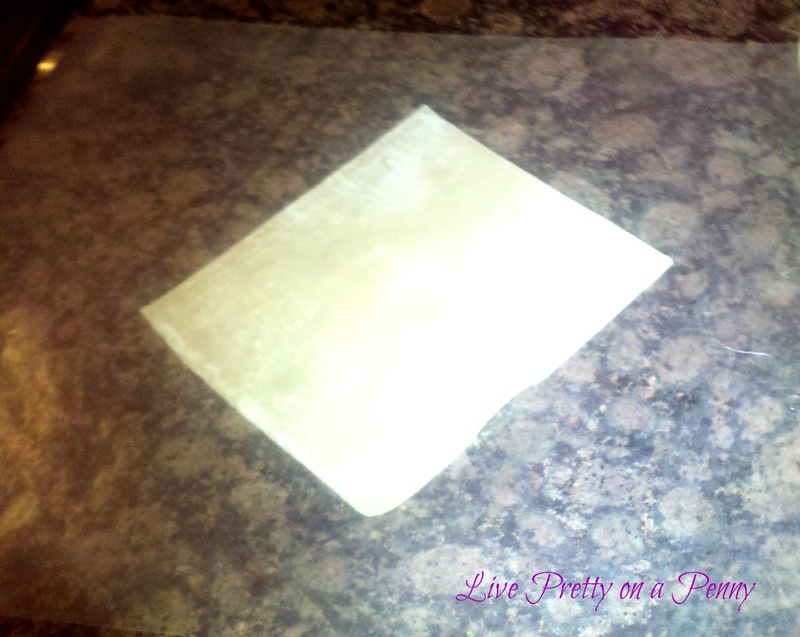 Cover your work surface with wax paper. Roll the egg rolls according to the directions on the egg roll wrapper package, using two tablespoons of the chicken mixture. (These are easier to roll with the wrapper at a diagonal angle toward you). Repeat until all of the chicken/vegetable/hot sauce mixture is gone. 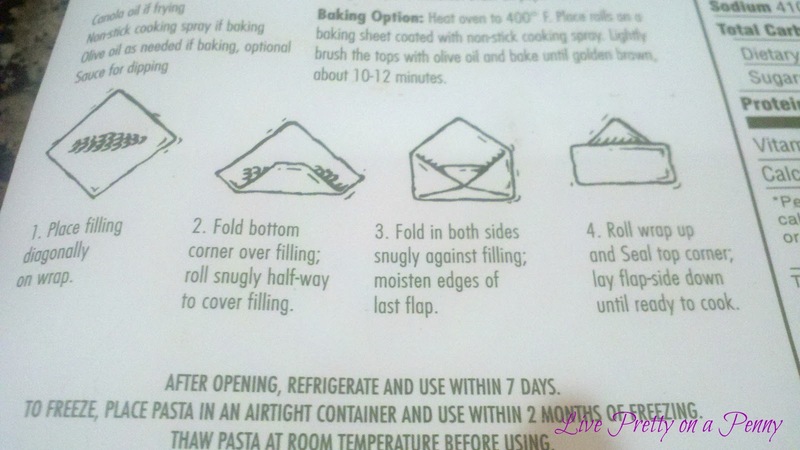 Or until you run out of egg roll wrappers. Our recipe yielded 16 total. When oil is hot, begin to add your egg rolls. 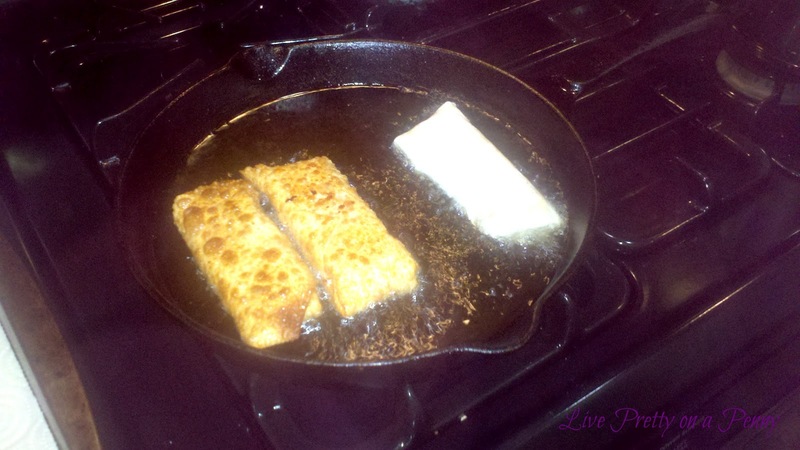 About 1-2 minutes per side or until golden brown. 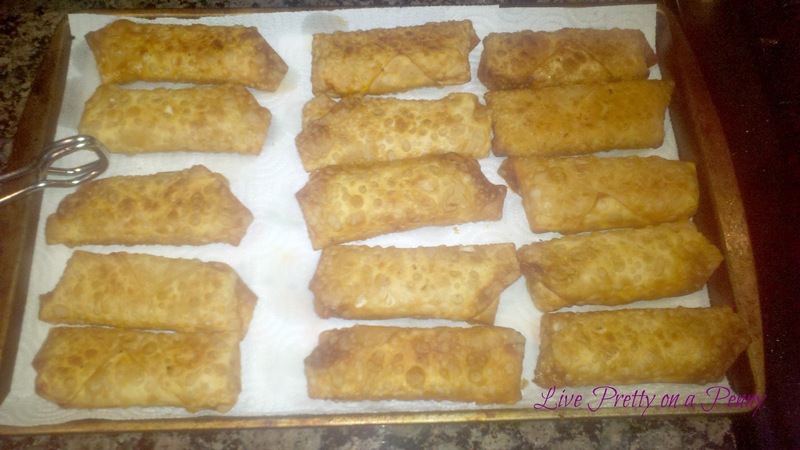 Remove egg rolls and drain on paper towels. Eat up and enjoy!!! (After letting them cool off a bit of course.J) Use ranch or blue cheese salad dressing for dipping. Also note, these can also be baked in a preheated 400 degree oven. Spray cookie sheet with non-stick cooking spray and lightly brush the tops with olive oil. Bake for 10-12 minutes or until golden brown. Previous Post Decorating and Making it Work…No Matter Where You Are! Next Post One Year Down..Forever to Go!